A High Court in London rules in favor of Abramovich, allowing him to keep his $5.6 billion. The commercial “trial of the century,” as dubbed by the British press, has come to a close in London. The $5.6 billion case saw Chelsea football club owner Roman Abramovich pitted against former Russian oligarch Boris Berezovsky, who filed the action but ultimately lost. He failed to convince the court that he had owned shares in Sibneft and Rusal, while the judge found his testimony “contradictory and not credible,” as opposed to the “accurate and complete” testimony of Abramovich. On Aug. 31, London's High Court dismissed the suit filed by Berezovsky against Abramovich for compensation worth $5.6 billion. The plaintiff argued that he had once been Abramovich’s business partner and, together with the late Badri Patarkatsishvili, had owned approximately 43 percent of Sibneft and 25 percent of Rusal. Berezovsky claimed they were forced to sell at bargain-basement prices under pressure from the defendant, who allegedly “intimidated” Berezovsky and took advantage of his worsening relationship with Russia’s then newly-elected President Vladimir Putin. Abramovich denied Berezovsky’s claims, saying that he had made payments only for “protection,” both physical and political, the latter through the plaintiff’s connections with the family of Boris Yeltsin. Justice Gloster concluded that there had been no oral agreement between the plaintiff and the defendant on the division of shares and income from their joint business ventures. For that reason, the circumstances surrounding the acquisition of Sibneft and various aluminum assets were of no concern. The court agreed with Abramovich that all payments to Berezovsky had been made in exchange for his support and “shelter” [Russian: krysha, literally “roof”], and that the $1.3 billion paid by Abramovich was not the sale price of Berezovsky’s and Patarkatsishvili’s shares in Sibneft, but rather a final lump sum to get rid of the “krysha”. The judge also believed that the alleged intimidation suffered by the plaintiff at the hands of Abramovich was ultimately unproven. Berezovsky said that he was “amazed” and “shocked” by the decision of the court, and that his faith in the British justice system had been undermined. He is currently taking time to discuss his next move with his lawyers, which could move for an appeal. “We have always maintained that Berezovsky’s charges were baseless, and this has been confirmed by the court,” the company’s statement reads. Berezovsky’s claims were based on an alleged “breach of trust” by Abramovich; such disputes are fairly common in the UK. “This is the legal remedy for the fiduciary relationship between a trustee and a beneficiary. Such claims are satisfied more often in English courts than in continental courts; nevertheless, examples of successful cases are few, and, in the absence of written evidence, the judge’s decision is always subjective. A lot depends on how the parties behave themselves in court,” said Denis Uzoykin of Uzoykin, Pisco & Colleagues. “In a Russian court, however, the likelihood of success is close to zero,” he added. Lawyers believe that the outcome of the case was influenced by Berezovsky’s somewhat dubious reputation. “Berezovsky has in the past speculated on the geopolitical situation, insisting that Putin's regime hounded him out of Russia and forced him to sell up,” said Grigory Chernyshev, a partner at the law firm White & Case. “If the judge had recognized the existence of the agreements on the division of assets between the plaintiff and the defendant, the court would have had to acknowledge the extent of Berezovsky’s influence over Russia’s economic policy in the 1990s, but it consciously declined to do so,” Uzoykin said. In late-September, the High Court in London will hear another case involving two Russian oligarchs: Mikhail Chernoy is seeking recognition of his right to a 13.2 percent stake in Oleg Deripaska’s Rusal. A spokesperson for Deripaska said that they welcomed the High Court’s decision to recognize the concept of “krysha” and its intrusion into business affairs. “It is an important decision, because it highlights the untenable foundation of Mr Chernoy’s claims,” said Deripaska’s spokesman. Meanwhile, a representative of Chernoy reported that his client was preparing for the start of proceedings with the firm belief that the Berezovsky-Abramovich ruling would not affect the outcome of his case, since he believes his evidence is sufficiently robust to stand up in court. Vzglyad newspaper reports that Berezovsky’s failure in court could soon bankrupt him. The disgraced businessman, who already has money troubles, will have to pay several million dollars for both sides’ legal costs. According to Vzglyad, Berezovsky has already started selling off his property. In 2009, he had to sell his Darius yacht for $345 million to a billionaire from the United Arab Emirates, and, in May 2012, the embattled oligarch was said to have sold his estate in the county of Surrey, which he had acquired in 2001 for $31 million. The biggest blow to Berezovsky’s wealth, however, came with his divorce from his wife Galina in 2011. Various estimates put the cost of the divorce for the oligarch between $150 million and $350 million, reported Vzglyad. 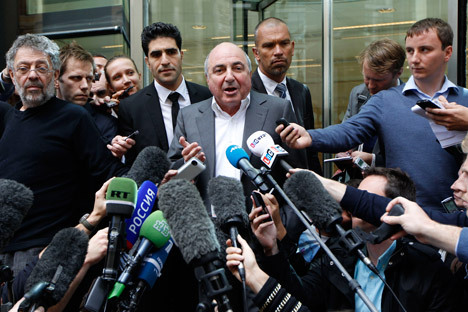 According to Forbes, Berezovsky’s fortune has rapidly been depleted over recent years. In 2008, Berezovsky was 29th on the Forbes list of the 100 richest Russians, and his wealth was estimated at $1 billion. However, in 2009, the oligarch failed to make it onto the list for the first time since 2004.